The Sabine's gull (Xema sabini) belongs to the family of terns and gulls, the Laridae. The Sabine's gull species is distributed in northern North America, northern Asia, northern Europe, southern Africa and South America. These gull species are trans-equatorial migrants. These gulls are polytypic species. The Sabine's gull (Xema sabini) is a small gull, measuring 25 to 35 cm in length and weighing 135 to 225 grams. The wingspan is 80 to 90 cm. These species are also known as the fork-tailed gull or xeme. The adult Sabine's gull has pale gray back and gray wing coverts. It has unique characteristic upperwing pattern. The primaries are black and the secondaries are white. The male gull has dark hood in the summer. There is a black band separating the hood. The neck, nape, breast and belly are white. The adult gull has slightly forked white tail. The juveniles have a black terminal tail-band. The bill is slightly down-curved. The bill is black with yellow-tip. The irises are black and there is a black eye ring. The legs and webbed feet are black. Their call is a harsh, very high-pitched and squeaking "kirrr" sound. The Sabine's gull species is distributed in northern North America, northern Asia, northern Europe, southwest Africa and northwest South America. These gulls are trans-equatorial migrants. 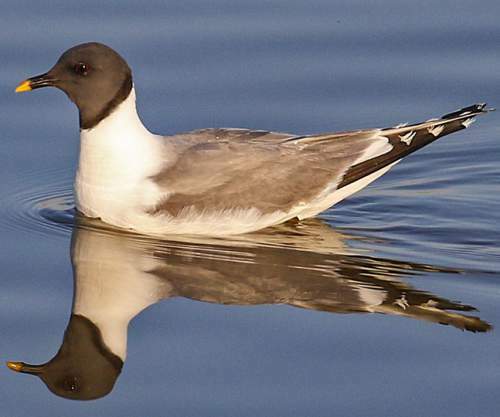 The Sabine's gull nominate subspecies X. s. sabini is distributed in Arctic Canada and Greenland. The subspecies X. s. woznesenskii is distributed in northeast Russia and Alaska. 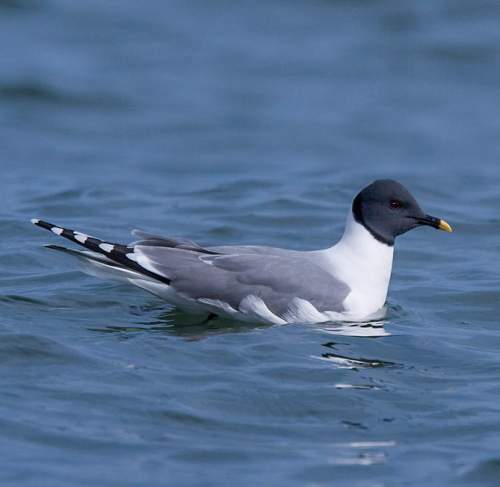 The Sabine's gull subspecies X. s. palaearcticais distributed in Spitsbergen (northern Norway), Taymyr Peninsula (Far North of Russia) and Lena Delta in the far north of eastern Siberia in Sakha Republic, Russia. The subspecies X. s. tschuktschorum is distributed in Chukotskiy Peninsula region of northeast Russia. Wintering birds are distributed in southeast Atlantic Ocean off the coast of southwest Africa and in east Pacific Ocean off the coast of northwest South America. 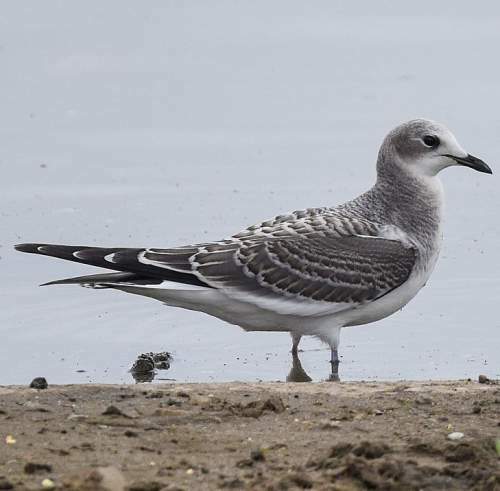 In India, a vagrant second-summer Sabine's gull was observed from Puthankadapuram beach, Thrissur district, Kerala (10°35’N, 75°59’E) by P. P. Sreenivasan et al. on 3rd May 2013. Vagrants have been observed in Australia, Angola, Ghana, Cameroon, Egypt, United Arab Emirates, Israel, India, Japan, South Korea, Germany, Poland, Romania, Italy, Belgium, Bulgaria and Cuba. The Important Bird and Biodiversity Areas (IBA) of these Sabine's gull species in USA are Barrow Canyon & Smith Bay and Chukchi Sea Nearshore. The IBA of these species in Russia is Lena delta and in Canada is Foxe Basin Islands. The IBA of these gull species in Spain are Costa da Morte and Entorno marino de las rías Baixas. The IBA of these species in Norway are Jan Mayen island and Northwest Spitsbergen National Park. These Sabine's gull species do not normally occur in forest. They normally occur in altitudes from 0 to 100 meters. The natural ecosystems and habitats of these gull species include, tundra grasslands, tundra wetlands, subtidal sandy, rocky, gravel flats, shallow seas with seagrass and macroalgal growth and open oceans and upwelling zones south of the equator. The diet of these Sabine's gull consists mainly of small fish. Insects, insect larvae, small fish, annelid and polychaete worms, molluscs, crustaceans, carrion, small birds and eggs of birds are their primary food. These gulls also feed on seeds and plant matter. The breeding season of these Sabine's gull species is during May and June in most of their breeding range. They breed in loose colonies. These birds are monogamous. The nesting sites of these gulls include coastal tundra wetlands, preferably swampy, moss and sedge tundra, low-lying shallow brackish water pools and mudflats. The nest is a shallow scrape on the ground or a cup shaped structure of grass, moss, seaweed and feathers placed on rocky and barren ground. The clutch may contain one to four olive-green eggs with brown mottling. The breeding pair take turns to incubate the eggs. These Sabine's gull species are fully migrant birds. Breeding Sabine's gull populations occur in circumpolar regions through northernmost North America and Europe and Asia. They migrate in small flocks and make long-distance southward flights during July and August for wintering. The return migration is in April and May. The wintering populations are mostly pelagic, occurring in cold water upwelling zones south of the equator in southeast Atlantic Ocean off the coast of southwest Africa and in east Pacific Ocean off the coast of northwest South America. The global population size of the Sabine's gull (Xema sabini) is estimated to be between 330,000 to 700,000 individual birds. The overall population trend of the species is considered to be stable. Throughout its range, this gull species is reported to be scarce to locally common. The generation length is 6.9 years. Its distribution size is about 9,270,000 sq.km. Habitat alteration and destruction, climate change and severe weather are the main threats that are endangering the survival of this gull species. The Sabine's gull (Xema sabini) does not approach the thresholds for being Vulnerable either under the range size criterion, or under the population trend criterion or under the population size criterion. The CITES (Convention on International Trade in Endangered Species of Wild Fauna and Flora) status is ‘Not Evaluated’ for Sabine's gull (Xema sabini). The Sabine's gull (Xema sabini) appears closely related to the little gull (Hydrocoloeus minutus) and ivory gull (Pagophila eburnea). The four tentatively recognized subspecies of the Sabine's gull (Xema sabini) are: Xema sabini palaearctica Stegman, 1934, Xema sabini tschuktschorum Portenko, 1939, Xema sabini woznesenskii Portenko, 1939 and Xema sabini sabini (J. Sabine, 1819). Current topic in Birds of India: Sabine's gull - Xema sabini.